Cars are a significant investment especially given the rising costs associated with gas, maintenance, and basic upkeep. We spend a significant amount of time in our vehicles, commuting back and forth to work, taking the kids to some event or another, and running errands all over the place. It is natural to assume that there is going to be a good amount of wear and tear not only outside, but inside the car as well. Given the cost, we most certainly want to do everything we can to minimize the damage done and to keep our cars in great condition for years to come. The number one way to maintain the good condition of your vehicle is to regularly clean the inside and outside especially after the winter months when salt and grime can build up. Since leather is becoming standard on most vehicles, we are going to focus on the cleaning and upkeep of this type of material. The following is a comprehensive look at some of the best cleaning products to clean and maintain leather car seats. As one of the top selling brands of leather cleaner, Leather Conditioner by Leather Honey is the first cleaner on our list. This cleaner has been around since the late 1960s and is a family-owned brand. It not only protects your leather seats, it has been known to help restore old looking leather. It is perfect for all types of leather including those found on furniture, shoes, jackets, and of course, the interior of your car. A major pro of Leather Conditioner is that is non-toxic and natural cleaner. It does not leave a sticky residue and is odorless, which is especially nice for small spaces like your vehicle. If you like to support small family businesses, then Leather Conditioner is the brand for you as it is made and manufactured in the US by the same family who created it. An added bonus is that once applied, the product’s effects last up to six months without reapplication. It is also water-resistant. While most of the customer opinions of this product are positive, the main con we noted was that the product can be thick and sticky when coming out of the bottle. This makes it difficult to apply sparingly to the leather car seats, which causes you to use more of the product than intended. The standard size bottle comes in an 8 ounce size so it could get rather costly if you go through a lot more of the product on a regular basis. Another top selling leather care product is Bick 4 Leather Conditioner by Bickmore. This product has been around since the late 1800s and is perfect for cleaning, maintaining, and protecting most leather products including car interiors. It is also known to restore old leather as with the Leather Honey’s Leather Conditioner. A major pro noted for this product is that is does not darken your leather car seats. This is a common problem with other leather conditioners and cleaners. It is also a wax-free product, which means that it will not sit entirely on top of your leather seats. This allows the seats to breathe and maintain their soft and comfortable feel. It also is not sticky and will not leave a film or residue. Bick 4 Leather Conditioner is an all-in-one product and only requires a one-step application, which cuts down on the time spent polishing your leather car seats. The product has garnered plenty of positive reviews and most customers say it works as advertised. The only compliant we saw regularly was that it can actually dry out some leather products, which can cause cracking. This leather care kit is the product of Chemical Guys who is a worldwide distributor of high quality car care products. It is a great product for wiping away stains and other messes on leather car seats without doing further damage. It helps to preserve the overall shine and look of the leather while not drying your seats out. This product contains both a cleaner and conditioner, which is ideal for cleaning stained leather and then restoring it using the conditioner. It penetrates deep into the leather to pull out deep stains and removes dirt and grime without leaving a slimy or stinky residue like some other products. It is also a water-based product that is not harsh on your delicate leather car seats. A big con of this product is the two-step leather conditioning process. It can be time-consuming if you are simply looking to maintain the look and feel of your leather car seats. Another complaint noted was that it required some dilution of the product and the instructions provided were not adequate for a first time user. This leather conditioning cream has been around since the late 1800s and is perfect for maintaining and weatherproofing all oil-tanned leather car seats. It comes in a perfectly compact tin that can be handy for storage and small leather touch-up jobs. Even though the container is small, customers have stated it goes a long way and will last a long time. It holds up against bad weather so it is ideal for weatherproofing your car interior against the occasional water droplets that may find their way onto your leather seats. This product is not recommended for distressed leather products so if you are looking for something to restore your leather seats with, then this is not the product for you. It also comes in a small 3 ounce container, which can prove costly if you need a lot to protect your entire car interior. Another top selling brand of leather cleaners is Weiman’s Leather Cleaner & Conditioner. This is an all-in-one product that can not only keep your car seat interior soft, but it cleans and strengthens the leather. It is an ideal product for all sorts of leather products including couches, boots, jackets, and auto interior. This product uses natural oils to keep your leather healthy and protected against moisture and heat damage. It is ideal for cleaning and restoring new and older, beat up looking leather seats. It also comes in a spray bottle, which makes it handy for application compared to similar products. The major con we noted was that it tends to leave a film all over the leather products. However, customers also noted that this film was easily washed off without damaging their car seats. Another complaint seemed to be related to the color of the leather they were trying to clean. If you have dark leather, then this product might not work well for restoring or cleaning without leaving a residue. Do not be fooled by the name, this product is actually great for leather car seat interior. It can restore faded and cracked leather and also cleans away water spot residue and stains. Interestingly enough, it also works wonders on exotic leathers such lizard and snake, which makes it great for high-end leather interior found in sports cars. It is a wax-free product that does not leave a residue and leaves your car seat leather looking shiny and new. Since it is wax-free, it will also not harden your leather interior, but instead it keeps it soft to the touch. This is another made in the US family-owned product, which may peak your interest if you like supporting smaller businesses. There were very little negatives noted about this product other than it could dry out your leather interior if not applied properly. Some customers also complained that it did not remove the entire stain even after multiple applications. However, no information was provided as to whether the stains were new or set-in. This top selling brand of leather cleaner comes in a small aerosol can which makes it ideal for application and easy to use. Garde Rain is mostly used for cleaning and protecting against water moisture. This product is not only easy to use, but it dries quickly and is not required to be rubbed into the leather car seat. This can be a bonus especially for anyone in a hurry. 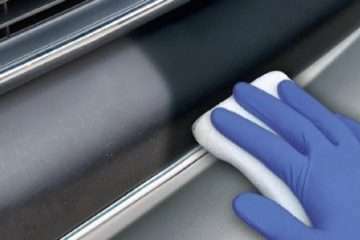 It is perfect for removing water stains and protecting against moisture inside your car interior. It does not leave behind a residue which is a common complaint of other products. There were no major customer complaints made against this product. All customer reviews appeared to be happy with the end result as purchased except maybe wishing it came in a slightly larger container. This product is ideal for car seat leather as it is made for leather goods that are subjected to excessive wear and tear. It is ideal for all-weather leather such as car interiors and protects against water and heat damage. It keeps leather feeling soft and keeps it from drying out once applied. A major pro of this product is that once applied it is also stain resistant, which can cut down on the task of cleaning your leather car seats. It is another small business manufactured product that will appeal to individuals looking to support family-owned businesses. It is perfect for leather and vinyl interiors. It comes in such a small tub that customers complained about the size and quantity especially for large leather car interiors. Customers also complained that it tended to darken their leather products, which may make it less than ideal for light colored car seats. This top selling leather preservative has been around for nearly 30 years. Believe it or not, this product was originally intended for use with the leather products firefighters wear. The company’s owner was a firefighter who got tired of replacing expensive boots over the years due to other products not maintaining and protecting against the harsh environments firefighters encounter. Given its history, this product is ideal for car seat leather that has to stand up to the damaging sun and harsh seasonal weather. It is known to repel water longer than other products, which makes for fewer applications. It can also restore and maintain older, cracked leather car seats. It is definitely ideal for those of us who are abusive to our cars on a regular basis. The largest complaint about this product was that it left a film or residue on the leather products. This is a common complaint with other leather conditioners and cleaners. Most customers stated they were able to wash the residue off after application with no damage to the product. Hopefully, we have provided plenty of information for anyone looking to clean, restore, or maintain their leather car seats. As with all products, there are many pros and cons depending on the intended use of the product. If you are looking to protect your leather car seats against bad weather, several of these products are better than others, while some are better for restoring old and faded leather. Another piece of advice we can give to anyone buying one of these products is to make sure that you test the product on a small, inconspicuous spot and allow the product to sit and dry for 24 hours. This will allow the user to ensure it is the right product for their leather car seats before applying to the entire interior. Remember if you take the time to verify the product first, then it will save you a lot of frustration later. Also, keep in mind to always follow the directions provided and consider looking up videos about proper application. This will also save you time and hassle along the way as there are always a lot of helpful videos out there on the internet. In addition, we recommend reading any online reviews of these products before investing your money.